Beauty. Adventure. Diversion. Just a few words to begin describing today. This morning, we woke up bright and early to set out for Ashirwad Estate in Sakleshpur. The four-hour drive was worth it for the experiences ahead. We arrived at the family home of Abeshik and his wife and were greeted by our gracious hosts with sweet lime juice. After settling in for a bit in their lovely bungalow, they showed us around their 60-acre coffee plantation. 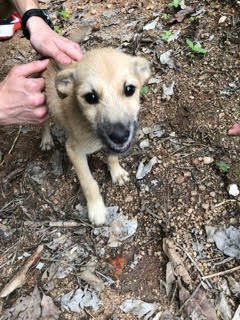 We learned about sustainable shade coffee growing, harvesting, and processing as we hiked around, accompanied by their adorable new puppy. 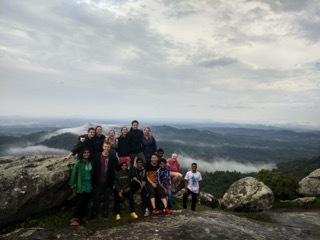 After a delicious lunch, a few games of friendly volleyball, some card games, and a thunderstorm, we traveled to Sakleshpur to trek up a mountain. Our guide lead us up steep cliff faces, past picturesque ponds, over scenic plateaus, and finally to the temple at the top of the mountain. From there, we could see lush forests for miles which were covered in a mist that gave it a serene glow. 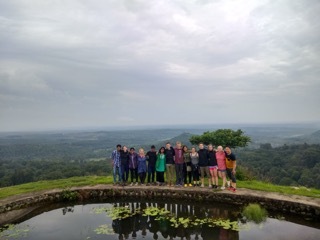 We could also see the outline of the Western Ghats mountain range looming in the distance. 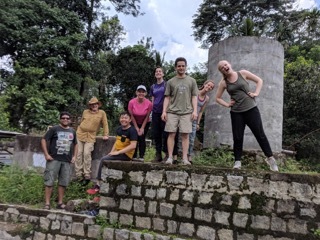 We explored the area with its many fun rock structures, puddles, and greenery, and spent time just being with each other, away from the constant stimulation of the city and our projects. It was a perfect opportunity to soak in the beauty around us and appreciate India for the beautiful country it is.